Truckloads of rice waited for a week to transport rice to Thailand, but border checkpoint remained closed by Thai authority. Banteay Meanchey - For more than a week, the Thai authority has closed the Robieng Checkpoint and banned the imports of Khmer rice to Thailand. The price of rice has gone down dramatically since the ban which caused Khmer traders to fall deeper into debt as most of them borrowed the money to buy rice from Cambodian farmers to export to Thailand. Cambodian farmers said that at the start of the harvest season the price of rice was good, but after the Thai authority closed Robieng Border Checkpoint, the price of rice had dropped dramatically. Sources said that all rice transported from various provinces to export to Thailand are now being stockpiled on the borders. Cambodian sources said that the reason of the border closure was due to the protests by Thai farmers living along the borders who demanded that Thai traders stop buying rice from Cambodia because the cheap imports from Cambodia have caused the price of rice in Thailand to drop dramatically. The Thai protesters demanded that Thai traders must buy all the rice from Thai farmers first before buying rice from Cambodian farmers. Cambodian rice traders said that the Robieng Checkpoint authority has demanded them to pay between 1500-2000 Baht per truck. Now they lose money because they cannot exports those rice to Thailand. Provincial officials said that Cambodian Rice Association has offered to buy rice from Cambodian farmers cheaply, that's why they sell their rice to traders who in turn export those rice to Thailand. 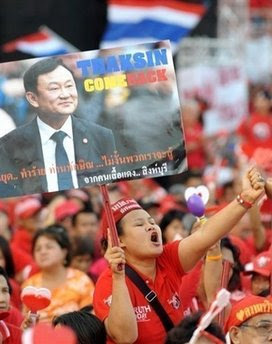 Protester holding a picture of Mr. Thaksin Shinawatra. Sources from the Thai media reported that on 30th January a group of red shirt Thai protesters, who are supporters of former Thai PM Thaksin Shinawatra, marched to the Cambodian embassy to present a letter to the Cambodian ambassador. The letter stated that the present Abhisit (Vejjajiva) government with Mr. Kasit Piromya as the foreign minister is not a legitimate government of Thailand. The letter also appeals to the Cambodian government to reconsider its relationship with the present Thai government. After they have presented a letter to the Cambodian ambassador, the protesters continued marching toward the Laotian and Vietnamese embassies to present similar letters to the Laotian and Vietnamese ambassadors. Oknha Srey Sothea received honours from Mr. Hun Sen.
It’s heartbreaking to see the hapless residents of the Dey Krohorm neighbourhood being evicted in an inhuman way by 7NG company in collusion with corrupt Phnom Penh officials. More than 150 families were forcibly evicted at gunpoint in the early morning of last week, when residents, including the young, the sick and the old, are still sound asleep. 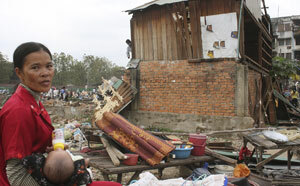 Their houses were razed to the ground while their belongings are still full. They have barely the time to escape the pounding of the demolition bulldozers. They lost everything. The pictures and the images of the evictions that splashed around the world are disheartening and heartbreaking. Now many of them are homeless - most sleep on the streets or camped in the parks. They lost their livelihood and now they are starving. The land at Dey Krohorm is worth about $3,500 per square metre. A few day before the evictions, 7NG promised the residents of between $15,000-$20,000 in compensation but now that the evictions have been successfully carried out, the compensation promises have now been reneged. The company now say they will only provide a home a few kilometres outside of Phnom Penh - a worthless real estate. Prime Minister Hun Sen has, in the past, promised that the government will strive hard to alleviate, and possibly eliminate, poverty in Cambodia. While Mr. Hun Sen had, to a certain degree, managed to raise the standards of living of some urban people, he has been seen as neglecting the less fortunate slum-dwellers and the people of rural Cambodia. These less fortunate slum-dwellers are paying the price for the developments, the lifestyle and the prosperity of the privileged few urban elites. Mr. Hun Sen’s policies of condoning, and in certain cases, abetting, forced and inhuman evictions, is a case of the “Robber Hood of Cambodia” robbing from the poor to give to the rich. Sombok Chap neighbourhood has been forcibly evicted a few years ago and most of the residents who had been resettled in the place provided by the company are still living in hardship. The evicted dwellers of Dey Krohorm will certainly face with the same fate or even worse, considering that all their belongings are demolished along with their houses. Next will be the “Building Neighbourhood” and the Bassac Theatre neighbourhood. The forced evictions of Dey Krohorm dwellers have been carried out by 7NG ruthlessly and with impunity without any fears of any legal ramifications. And after the evictions, Oknha Srey Sothea, the owner of 7NG, has been quoted as arrogantly saying that, any monetary compensations are out of the question. As such, the evictions seemed to have the backing and the blessing of Mr. Hun Sen because the owner of 7NG is Oknha Srey Sothea who is very close to Mr. Hun Sen. In Cambodia, there is a saying that nothing can be done without the approval, or the blessing, of Mr. Hun Sen.
Mr. Hun Sen, and the court in particular, must condemn these forced evictions in the strongest term and force 7NG to make a reasonable compensation package to these rightful owners of Dey Krohorm neighbourhood. Anything less than the amount they are entitled to would be tantamount to a collusion of crimes punishable by Cambodian laws. Aussie team moved mountains of sand as part of Habitat for Humanity program to erect houses using volunteer labour. Australian Geelong Grammar students take a break from hauling sand on Tuesday. Habitat for Humanity says that over the next few years it aims to assist some 5,000 familes across the provinces of Kampong Spey, Kampong Cham, Siem Reap, Banteay Meanchey and Phnom Penh in building and renovating their homes and water systems. Five students and two teachers visiting Cambodia from Australia's Geelong Grammar School spent the last week hauling mountains of sand - 90 tonnes to be precise, they say. The team, from the state of Victoria, have been constructing two homes for recently evicted families. The project was organised by the NGO Habitat for Humanity to provide homes for families relocated to Phnom Penh's Samaki village. Nimol Kive, Habitat's project manager, said his organisation plans to construct 30 homes for families in Samaki village by November with the help of around 500 volunteers. For the visiting students, the labour has come with unexpected perks. The students were visited on their work site by Deputy Prime Minister Nhek Bun Chhay and opposition leader Sam Rainsy, and Prince Norodom Ranariddh hosted them for lunch. "We've had a really rewarding stay." said Justin Corfield, the supervising teacher. "A benefit of this program has been the practical side, where the students get to actually see where the money is going rather than writing a blank cheque," he said. "The students also wanted to fund a project they could contribute to with their own time and efforts." Students from the school independently raised more than US$8,000 during the year to fund the trip and building project. "The students approached me with the idea to fund a community organised by Habitat for Humanity about a year ago. Cambodia was geographically the closest country for us to partner with, and we have had several dignitary visits to our school, with Sam Rainsy paying over three visits during the past 10 years," said Corfield. The students were also drawn to Cambodia after hearing broadcasts aired on Australian radio programs about evicted families. Sam Aull, 17, called the experience "challenging but rewarding". "I have never been to Asia before, and the absence of a middle class has astounded me," he added. Student Sabrina Tee saw the trip as the first of many. "I hope this program continues to grow and students can again come over next year to help these families," said the 17-year-old. "It's been such a rewarding experience, but definitely hard work." Corfield said he planned to institutionalise the trip to make it a mainstay for successive classes at the school. NRP officials condemn students for ‘defaming' retired Prince Norodom Ranariddh as royalist party falls further into disarray. Prince Norodom Ranariddh shown here in a file photograph. ACAMBODIAN student group claimed ownership of the Norodom Ranariddh Party (NRP) Thursday, urging current leaders to defect and arguing that they have no firm strategy for carrying the party forward. "I have not defected to any party. [The NRP] is my party. I used to be deputy president of the Khmer Front Party," she said. "We must remain in order to protect the party that we gave birth to and to preserve our ideals for the nation." 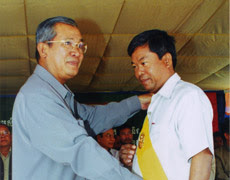 The NRP took its current shape in 2006 when the Khmer Front Party, formed from the Democratic Front, backed Ranariddh and adopted his name for the party. Her comments follow accusations by the NRP that the student group had defamed former party leader Prince Norodom Ranariddh, who retired from politics in October and whose connection with the party has been a matter of ongoing contention. 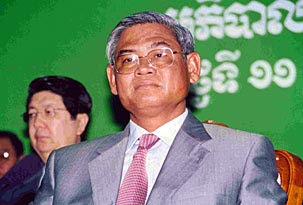 Sun Sokun Mealea said Ranariddh's retirement effectively left ownership of the party in the hands of the Democratic Front. Kim Sok, a spokesman for the Democratic Front and a member of the NRP, told the Post Wednesday that the student group had lost faith in Ranariddh and the NRP's current leadership. NRP officials were unavailable for comment Thursday, but the party issued a statement Wednesday condemning the student group and accusing it of defaming Ranariddh. Although the Preah Vihear issue seems to have cooled down, the Foreign Ministry's mission to build people's understanding about the issue continues through the Phra Viharn Centre headed by Paskorn Siriyaphan. The former diplomat based in Phnom Penh talks to THANIDA TANSUBHAPOL about this newly established office. 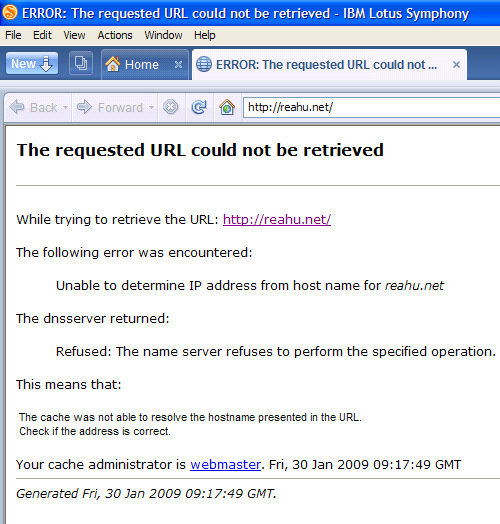 Why was the centre set up and when did it start operations? The ministry set up the centre on Oct 8 last year and it started operations six days later. The centre is under the permanent secretary's office and is supervised by the Legal and Treaties Department chief. Its mandate is to improve coordination among internal departments on the Preah Vihear issue. The International Organisation Department deals with Unesco, the Legal and Treaties Department deals with border issues, the East Asian Department deals with Cambodia on bilateral issues and the Information Department deals with public relations in general. In addition, the centre will also take care of other issues which are not the particular responsibility of any department as well as acting as the secretariat for Preah Vihear issue meetings. The centre was also set up under Article 190 (3) of the constitution which stipulates that prior to any binding agreements [about a border line change] being signed with the international community or an international organisation, cabinet must inform and provide the opinions of the public to parliament and be ready for any queries related to such an agreement. The centre is responsible for providing information and listening to the public while border and demarcation talks with Cambodia are in progress. What information has the centre given to the people? We have four kinds of information. The first is the background of the border issue. The second describes the causes of the tension last year after Cambodia was trying to list the Preah Vihear temple as a World Heritage site while some parts of the compound would have affected Thailand's rights as a claimant. The third explains what happened as the military forces of the two countries were still there. And the last explains what the ministry is doing to cut tension in the short term and negotiate under the framework of the Joint Boundary Commission (JBC) in the long run. What is the aim of the centre? We would like people to understand more about the Preah Vihear issue and try not to use emotions or misunderstand things to launch accusations against each other. Foreign Minister Kasit Piromya reaffirmed that the sharing of information with people must be done transparently and without conflict of interest. He has also made this a priority of the centre. The centre has also opened a webpage at the ministry's website to listen to public opinion. It will also develop booklets about the issue for public distribution soon. What is your plan for sharing information with the public? We plan to reach out to people in each province every month. We held three public opinion sessions. After parliament approved the short- and long-term negotiation frameworks with Cambodia on Oct 28 last year, we held the first session at Chulalongkorn University on Nov 6, the second on Dec 16 in Si Sa Ket and the latest on Jan 20 in Chanthaburi province. The information will not be the same every time as we will update it to include the latest results of the minister's visits to Cambodia or the outcome of the latest JBC meeting. We plan to repeat this in all seven provinces along the Thai-Cambodian border. Has public opinion changed after the three public meetings? Yes. I think they understand the issue better. We will not try to argue with the public but will give them all the necessary facts. People in Si Sa Ket and Chanthaburi shared the same opinion that we must protect Thai sovereignty and must have a clear position over the Preah Vihear issue. In the meantime, we must also keep a good relationship with Cambodia especially in trade between our two peoples. They would like to see trade come before politics and would like the situation to return to normal. As long as there is a negotiation mechanism, the tension along the border will be toned down. Border demarcation will surely take a long time to complete but we should do everything to avoid further confrontation. I live in the village of Anlong Khran in Cambodia. One day a man came to the village and said we should go to Thailand as we would have a much easier life there. Here, we work in rice fields, growing our own rice and vegetables. We make up to $200 a year. The man said we would make a lot more than that in Thailand. He took a dozen of us over the border. We paid him 7,000 Thai baht for this – 3,000 for the transport plus a month’s worth of our pay. He said we would work on the riverbank, in factories, and have a much better life. When we got to Thailand he took us to a house. Suddenly we were locked up inside it, all of us together in one room. It was only then that I realised that we had been sold. We tried different ways of escaping, all of us, but we had no money, passports or papers; there was nowhere for us to go. We stayed there all night. Then, at about 4am, we got a wake-up call. Some men took us to a fishing boat, and that's when I realised what would happen to us. We had been trafficked. It was too late to do anything. We were powerless. At sea, we all got seasick. I remember it got so bad for me that I was vomiting blood. As a group we decided we would stick at it for one month, earn our wages and then somehow get back to Cambodia. The boat's owner told me we would have to work for him for at least three years. I found out that there is a whole system at work: a good employer lets you go ashore after eight or 10 months and pays you off, but a bad one will keep you at sea for three years and not pay you anything, or just a token amount. Conditions on board were very hard for us. We worked all hours of the day, and there was little food or fresh water, just one small bucket. If we got a big catch we’d have to work day and night, slicing and gutting fish. If there was a torn net we would have to work for two or three nights without sleep to repair it. Another boat would sometimes meet us to take the catch and give us more food and water. We scarcely saw land. I saw killings too, with my own eyes. There were three Thai crew on board and they were all armed. The captain would physically abuse us. In the early days he beat me nearly unconscious. He would beat us with the tentacle of a squid or sometimes a large shell. The man I saw killed was beaten and then thrown overboard. Another time, a man was shot and his body thrown into the sea. We were constantly plotting to kill the captain and take the boat ashore. But the crew had guns and we knew we couldn't do it. I was transferred to other boats after that first one. In the end I was at sea for two years. Finally, when a boat I was on put ashore in Thailand I persuaded them to let me go. They took me back to the border in a truck and left me there. With the help of one of the traffickers I got back across the border into Cambodia. There are many people from my area who still want to go to Thailand. I tell them about the cruelty and the lies, but they are determined. The problem is there is so little to do here. We used to make money from charcoal, cutting and burning trees, but the government stopped that for environmental reasons. How else are we supposed to make a living? • Chorn Theang Ly was talking to Jonathan Gorvett in Cambodia. 30 January 2009 – The forced evictions of tens of thousands of Cambodia’s poor constitute a “grave breach” of human rights, a United Nations independent expert said today, calling for damages to be paid for lost homes and the provision of alternative housing. In the middle of the night last week, over 130 families were forced to leave their homes without prior notice in the capital, Phnom Penh, so that a private company could redevelop the site. The shelters in the poor community were destroyed, and there have been reports that before the eviction, the community suffered intimidation and that the area’s representatives were subject to criminal charges. She noted that last week’s evictions in Phnom Penh are not isolated, but are “[alarmingly]” on the rise, with tens of thousands of people losing their homes and becoming even more destitute. In the South-East Asian nation, the expert said, there has been a “consistent pattern” of rights violations tied to forced evictions, including the systematic lack of due process, inadequate compensation, and the excessive use of force. Ms. Rolnik, who reports to the Geneva-based UN Human Rights Council, took up her post last May and serves in an independent and unpaid capacity, as do all Special Rapporteurs. GENEVA, Jan 30 (Reuters) - The Cambodian government is forcing tens of thousands of poor people from their homes in a grave breach of human rights, a U.N. investigator said on Friday. Raquel Rolnik, United Nations special rapporteur on adequate housing, called for a halt to the evictions in the Southeast Asian country. "The increase in forced evictions throughout Cambodia is very alarming," Rolnik said in a statement. 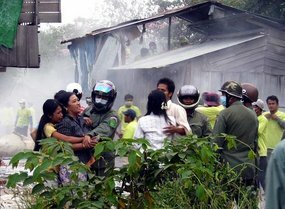 Cambodian police fired teargas to move more than 130 families last weekend from a Phnom Penh slum facing the Mekong River, without giving them prior notice, she said. It was the latest of a series of land disputes in the country where garment factories and hotels are springing up fast. Rolnik, a Brazilian architect and urban planner, said those evicted from the site that the Cambodian government had sold to a private company should be compensated for losing their homes. Witnesses said an elderly woman and a boy were hit by a bulldozer during the nightime eviction, and other residents were injured by clubs and stones, some seriously. Police denied using excessive force against the group who had waged a 3-year battle against their eviction. "We did not use violence against them, but tear gas to disperse the people who resisted," Phnom Penh police chief G. Touch Naruth told Reuters. In her statement, Rolnik said Cambodia sould stop the practice that results in increased homeless and destitution. 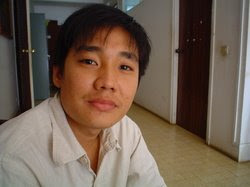 A former freelance editorial cartoonist for Far Eastern Economic Review from 1997-1999, Bun Heang Ung presently lives in Australia. Observing his home country Cambodia from the other side, the 57-year-old cartoonist launched Sacrava Toons blog in 2004, nearly a decade after he published ‘The Murderous Revolution : Life and Death in Pol Pot's Kampuchea,' his first book of black and white line illustrations that tells his very own experiences of the Khmer Rouge regime. In voicing his opinions, the talented cartoonist publish his drawings of all things that matter to him on the Web. 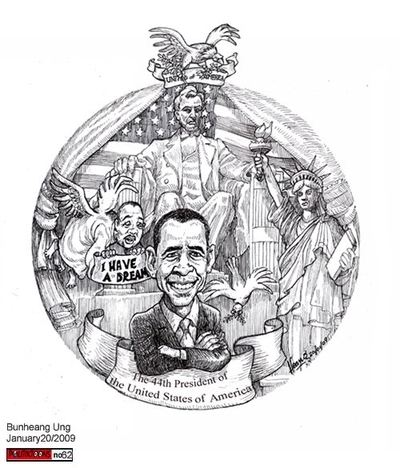 In one of his recent posts, he used ‘I have a dream' as a backdrop for his illustration of Barack Obama, the 44th President of the United States. One of the many golf courses at Angkor in Siem Reap, Cambodia. The Thailand - Vietnam - Cambodia Golf Trail is fast becoming the worlds most talked about golf tour. Announced just 6 weeks ago by Indochina’s largest specialist golf travel operator, Golfasian, the golf trail makes it now possible for golf enthusiasts from around the world to play the premier courses in three of the fastest growing Asian Tiger countries. 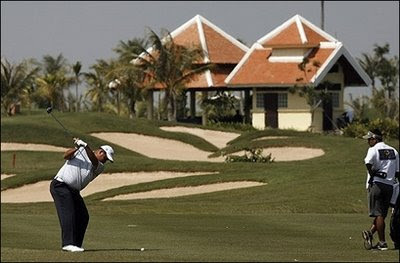 Participating golf courses on the trail include Thai Country Club in Bangkok, venue for Tiger Woods’ PGA win in 1997, the Montgomerie links Vietnam, Colin Montgomerie’s only golf course in Asia, and the Angkor Golf resort, a challenging Nick Faldo layout that has already received acclaim as the best golf course in Cambodia. In additional to golfing, the Thailand-Vietnam-Cambodia Golf Trail affords visitors the opportunity to visit several world heritage sights including, Ayutthaya in Thailand, Hoi An in Vietnam, and Angkor Wat in Cambodia. Each destination is unique in it’s culture, architecture, and history, all dating to the 10th century. Over the course if the next year the trail will be even further enhances with the opening of several new golf courses. Golf is the perfect activity to base a holiday around and this can be seen in the rapidly expanding and successful business of Golfasian. Golfers who demand more from their holiday than just excellent golf should consider this one-of-a-kind and affordable golf trail. 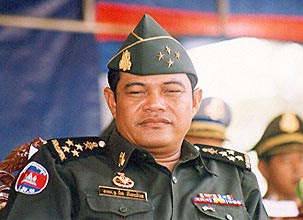 GENERAL Ke Kim Yan (pictured), former commander-in-chief of the Royal Cambodian Armed Forces, is uncertain of the future following his unceremonious removal from the post last week. "I have no idea of what work I will do in future," Ke Kim Yan told the Post Thursday. "The whole country knows I have stopped being commander-in-chief, [so] let everything be quiet from now on." The general previously said he resigned his post for "health" reasons, but Deputy Prime Minister Nhek Bun Chhay said Tuesday that the CPP stalwart was removed by Prime Minister Hun Sen because his business activities were distracting him from his role as head of the armed forces. "Prime Minister Hun Sen told a Cabinet meeting that Ke Kim Yan has a lot of land. He is a military officer, and he is also involved in business," he said. "While he is in the military and does business, he should give up his work." But a senior official in the Council of Ministers, who declined to be named, said the prime minister was more specific, saying the former RCAF chief was removed for illegal land deals and failing to fulfill the duties of his office. "Ke Kim Yan was withdrawn from the post of commander-in-chief because he has much illegal land and is not active along the border with the soldiers," the official quoted Hun Sen as saying during the Friday meeting. "He has a lot of illegal land in the provinces ... and he is not as active as other commanders like Kun Kim and Hing Bun Heang." "There are bigger problems than this, but we can't release them to the public. They are internal issues," the official added. PHNOM PENH, Jan. 30 (Xinhua) -- The Cambodian government plans to deploy 27,133 police forces to safeguard the commune councils election in all its towns, districts, cities and provinces in May, national media said on Friday. 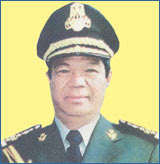 The deployment aims to guarantee safety and order of the election, the state-run Television Kampuchea quoted Sar Kheng (pictured), Deputy Prime Minister and Minister of Interior, as saying. "We want the election process to be free, fair and with justice," he added. On May 17, Cambodia will hold its nationwide election for positions on district, provincial and municipal councils as part of the government's drive to transfer more decision-making powers to the local level. Several websites have published articles, videos, pictures and songs to mobilise Internet users about the fate of the families evicted on Saturday 24th January from Dey Krohom, a neighbourhood in the capital of Cambodia. Cambodian police firing tear gas, an army of young workers demolishing frail houses with sledge hammers and axes, bulldozers crushing everything on their way at the risk of injuring tearful residents fleeing with the few possessions they have managed to save in the chaos... These images of the violent operation to evict the last residents of Dey Krohom, in Phnom Penh on Saturday 24th January, were not broadcast on CNN or any major international television network. Yet, for the last few days, they have been going round the world through the Internet and its new “social networking” tools, like Facebook, YouTube, Flickr, Blogspot or Wordpress. Gradually, after the initial emotional reactions, outraged Internet users are trying – and somewhat struggling – to raise awareness about what happened with the widest possible audience, in Cambodia and abroad. One of their first actions is to launch an international appeal to draw mass protest against the Cambodian authorities and the 7NG company. “Dear Prime Minister Hun Sen, I am writing to express my shock at the violent eviction of the Dey Krahorm on January 24th, 2009 and to request that the evicted families receive adequate compensation for their losses.” So begins one of the two “sample letters” published on the website of the organisation "Bridges Across Borders " who invites Internet users throughout the world to copy and send these letters by email or fax to the head of the Cambodian government as well as the Minister of the Council of Ministers Sok An, the Chairman of the National Assembly Heng Samrin, the Governor of Phnom Penh Kep Chuktema, and the Chairman of the 7NG company Srey Sothea. The appeal is also relayed through emails and on a group page dedicated to land conflicts in Cambodia on the social networking website Facebook . The page was created at the initiative of John Weeks, aka Jinja (or The Gecko in Khmer), an expat blogger in Cambodia who is very active in the Cambodian web circles and responsible for an important compilation of the different sources of information available on the Dey Krohom case . To this day, some 400 members have joined the Facebook group and publish statements, press articles, photos and videos on evictions in Cambodia. The messages posted on the Facebook page originate from Phnom Penh of course, but also from remote Colorado (United States), Canada, Ireland, Switzerland, Australia, Thailand, Hongkong, Philippines, India, or China... Some send a simple message to express their indignation, while others call for concrete actions, including donations of food or basic necessities. The group set up on this networking site also – and essentially – serves as a hub for all the written, photographic and audiovisual documents, which represent as much evidence on the eviction. It includes links to the multimedia slideshow and trilingual articles of... Ka-set , videos shot in the middle of the eviction, like the one co-produced by Platapus and Licadho Canada which was initially made available on-line on BlipTV and other “footage rushes” made public on the YouTube video broadcasting site or the human rights multimedia platform The Hub . Also available on these websites, many archive documents, whether on the daily lives of the Dey Krohom residents , before their eviction, or on other cases of past or ongoing evictions, like at Boeung Kak lake. Also, voices are heard on blogs and echoed on the website Global Voices which offers a panorama and excerpts of bloggers' reactions. Other bloggers also share what they saw, comment on articles or, like Steve, Wendy, Isaac and Niam , the four members of an evangelist family working in Cambodia, express their anger and call to pray for the evicted residents of Dey Krohom. Discover on the website SendSpace "Do Not Agree ", a song written a few days before their eviction by one of the Dey Krohom community representatives, Chan Vichet, and performed among and with other residents. An English translation of the Khmer lyrics is also available on the same website in a PDF file. Also see the Bassac project of Khmer-American rapper PraCh, which part of his blog Mujestic.com is devoted to. “More than 130 families were forcibly evicted during the night of 23 and 24 January 2009 from Dey Krahorm, in central Phnom Penh to make way for a private company to redevelop the site. The forced eviction was carried out in the middle of the night, without prior notice and the shelters belonging to this poor community were torn down and destroyed. This situation has grave consequences for all the victims, but particularly the women and children. Reports also state that prior to the eviction, the community suffered intimidation and community representatives and members were also subjected to criminal charges. It is regrettable that the ongoing negotiations with the residents were abandoned, casting aside a valuable opportunity to reach a just and lawful solution to this longstanding dispute. It is now of utmost importance that the rights of the residents to fair compensation for their lost homes and property and the provision of adequate alternative housing are fully respected. Unfortunately this is by no means an isolated case, and the increase in forced evictions throughout Cambodia is very alarming. Reports indicate that tens of thousands of poor people have been forcibly evicted and displaced, pushing them into homelessness and further destitution. In Cambodia, a consistent pattern of violation of rights has been observed in connection with forced evictions: systematic lack of due process and procedural protections; inadequate compensation; lack of effective remedies for communities facing eviction; excessive use of force; and harassment, intimidation and criminalization of NGOs and lawyers working on this issue. The former Special Rapporteur on adequate housing conducted a mission to Cambodia in 2005 and presented a mission report on his findings and recommendations (E/CN.4/2006/41/Add.3). Concerns on forced evictions in Cambodia have been shared through a large number of communications by the Special Rapporteur with the authorities. These communications remain unanswered to date. Yvonne was singing at the Greenbelt festival in Cheltenham last year and later got an e-mail from Christian aid organisation Tearfund. She explained: “A woman who had been there enjoyed the way I wrote and how I observed the world in my songs. She invited me to go as a guest on this team of women going to Cambodia looking at women’s issues in poverty and attending a leadership conference. “She said Tearfund see it as a good thing to invest in artists. She said that if the trip inspires me and I write something that they can use in the future then great or if I talk about the experience at gigs it will have done its job. Among the team are a youth worker and a representative from Premier Christian Radio. During the 10-day trip the group are visiting projects run by Tearfund partner organisations, hospitals, churches and stay in a village for two days with a family dealing with HIV/Aids. Yvonne plans to start work on a new album, her fourth, in the spring. Since the sacking of Gen. Ke Kimyan as the Commander-in-Chief of the Royal Cambodian Armed Forces (RCAF) and the sacking of Gen. Chhin Chanpor as the Deputy Commander of the Military Police, there are rumours that there will be more sackings. Ge. Kum Kim (pictured), Deputy Commander-in-Chief of the RCAF, said that there is no further removals of any military leaders from their current positions. He added that the rumours are intended to cause anxiety in the military. Gen. Kun Kim told Reaksmei Kampuchea that the removals of Gen. Ke Kimyan and Gen. Chhin Chanpor is just the beginning of a military reform. There will be no more removals of any military leaders, but there will be some reshuffles in accordance with the military reforms carried out by the new government. Gen. Kun Kim said that these sorts of rumours have caused nervousness in the military. He said that the rumour are not true. According to sources, Gen. Chhoeun Chanthorn alias Mao, commander of a bodyguard unit, has been sacked. But Gen. Kun Kim said that there is no sacking yet, but he added that there will be further reforms in the bodyguard unit as well in order to reduce the numbers of bodyguards. But sources from the Interior Ministry said that all bloated bodyguard units will be cut down. Sources said that, under the new government, all bodyguards will not be allowed to have dual roles. In the past, some bodyguards use their bodyguard roles to intimidate other people for personal interests. In another development, sources from the Defence Ministry said that Gen. Huy Pisith, Deputy Chief of Prime Minister Hun Sen’s Cabinet, has been appointed as the Under-Secretary of State of Defence on top of his current role. The United Nations has condemned the violent eviction of about 150 families from a slum in the capital Phnom Penh, describing it as an abuse of the country's land law. Tear gas, rubber bullets and batons were used to chase residents from an area known as Dey Krahom, or Red Earth, on Sunday, after they refused to sell their land to a construction company planning to build a business centre on the site. The remaining houses were flattened by bulldozers and the former residents were forcibly relocated to an undeveloped patch of land outside the city. In a statement, the Cambodian office of the UN High Commissioner for Human Rights described the incident as the latest in a long series of violent evictions. The Cambodian government is facing mounting criticism for forced evictions throughout the country, which have increased as land prices have risen over the past few years. Last year more than 20,000 people were reportedly driven from their homes. THE fading colonial charm of the French-built Renakse Hotel in Phnom Penh has faded for good. The last guests have been pushed out and the windows boarded up. A property boom in the Cambodian capital has brought a whirl of demolition of old buildings, plans for new high-rise developments, and speculative investment in satellite towns. The victims of this have been Phnom Penh’s poor. Last week police and private security guards roughly evicted 120 families from Dey Krahorm, a slum in the centre of the city, on the orders of Phnom Penh’s governor. The firm developing the area, 7NG, is linked to the ruling Cambodian People’s Party, the CPP, led by Hun Sen, the prime minister. The company plans to turn the site into an upmarket retail park. Nearby, a famous park area known as the Boeung Kak lake is also to be developed, bringing the eviction of 4,500 residents. Many had been living around the lake for 20 years. They have been offered only paltry compensation, and have been relocated to the city’s outskirts with no amenities or obvious way of making a living. The controversial plans involve filling in 90% of the lake. The CPP has ditched past commitments to conservation and environmental protection, as the boom has driven prime-land prices in Phnom Penh up tenfold in two years, to $5,000 per square metre. The municipal government has granted a 99-year lease on 133 hectares (330 acres) of the Boeung Kak site to a CPP senator, Lao Meng Khin, who is also a director of a company called Shukaku, for a mere $79m—a fraction of its estimated true market value. In April 2008 Mr Khin signed a deal with a Chinese company to turn the lake area into a posh residential and recreation development, to be dubbed the “New City of the East”. A Korean company is building a similar city, known as CamKo, on Phnom Penh’s outskirts. Critics say the Boeung Kak deal is illegal. Cambodia’s 2001 land law declares all lakes public property that cannot be leased for more than 15 years. The authorities say the deal was legalised by a 2008 decree from Mr Hun Sen’s cabinet, reclassifying “state-public land” as “state-private land”. Mok Mareth, the environment minister, initially raised concerns that filling in the lake would do serious damage to Phnom Penh’s drainage system. This, he argued, would violate a 1996 law ordaining that Cambodia’s natural resources should be conserved, developed, managed and used in a rational and sustainable manner. Indeed, since August 2008 when developers started filling the lake in, some houses have already started sinking. An independent report released earlier this month by an Australian assessment team gave a strong warning against the project. It concluded it would lead to an increase in flooding, and would endanger water quality and public health. Two decades ago, children paddled boats on the lake, families enjoyed picnics, and Mr Hun Sen used to entertain foreign visitors at a modest but picturesque bamboo restaurant. But today, as the bulldozers are poised to raze old Phnom Penh and plug its favourite lake, the urban poor are starting to feel nostalgic for a time when a park really was a park and not a so-called “state-private development zone”. SIX months ago they were being fêted in Edinburgh, cheered by crowds in the Festival parade and winning four-star reviews for their show of traditional monkey and peacock dances. But the Cambodian teenagers, who performed as the "Children of the Khmer" in Scotland last August, are among hundreds of people who have lost their homes in a slum clearance in the centre of Phnom Penh, The Scotsman has learned. of Dey Krahorm had been fighting eviction for three years until police and bulldozers moved in this week. Many of the dancers affected are orphans or from poor single-parent homes. Thoem Bunleng, at 21 one of the oldest performers, who played a monkey drummer in Edinburgh, watched while his home was razed. "His father just died, and he couldn't afford to pay for the funeral, and he is basically homeless," said Richard Chappell, who helped bring the Cambodian group to The World venue in Edinburgh. "He is staying in one of the classrooms we have in Phnom Penh." Witnesses described demolition workers rocking stilted houses till they fell apart as inhabitants tried desperately to remove belongings. Amnesty International this week called on the Cambodian authorities to stop the demolitions and ensure adequate compensation and restitution for those evicted. Opposition MPs also condemned the "grave violences" of the municipal authorities in the Cambodian capital. Amnesty said more than 150 poor urban families had lost their homes when a force of about 250 police, firemen and workers moved in at 3am, dispersing protesters with tear gas. "The most urgent task now is for the government to immediately address the humanitarian needs of these people, who have lost their homes and face imminent food and water shortages," said Amnesty's Cambodian researcher, Brittis Edman. The Cambodian families claim they have legal rights to the land their shanty homes are built on, but that local authorities signed it over to a developer as property values have skyrocketed. The development company, 7NG, claims to have offered up to $20,000 (£13,986) compensation. But many of those evicted have said they do not know how to apply for payment – which will be far harder to do now they've been forced out. The company offered alternative accommodation, but it is said to be several miles outside the city with no facilities and no running water. One girl dancer, Chandaloy, who lived in little more than a cupboard, lost her home yesterday. "They have full legal right to their houses, they are not squatters. All the simple ground-level houses have been cleared. Stage two is the apartment buildings," said Mr Chappell. The Children of the Khmer show featured 26 young Cambodians trained by Cambodian Living Arts. CLA is a non-governmental organisation which supports traditional Cambodian artforms, widely banned under the Khmer Rouge. More than 100 CLA students and at least five teachers live in Dey Krahorm. John Simpson, of the World venue, which brought the Cambodians together, said: "The real interest for us is to follow through on the projects with the Cambodians. We are going to bring them in 2010 and this will certainly not stop us. "I am sure the people of Edinburgh will be as welcoming and supportive as they were last time. It means a lot for the kids to know the people they met in Edinburgh are supporting them during such difficult times." Anyone wishing to help can send an e-mail to info@theworldfestival.com. UNDER the Khmer Rogue regime of Pol Pot, at least 1.7 million Cambodians, some say more than two million, died of starvation, disease and executions during the dictator's primitive experiment in human engineering, called "Year Zero". The idea behind Year Zero was that all culture and traditions within a society must be completely destroyed or discarded, replaced by a new revolutionary culture. Consequently, about 90 per cent of the country's performing artists died during the Khmer Rouge regime, a devastating blow to all of Cambodia's ancient traditions. After the fall of the Khmer Rouge, the cultural tragedy was compounded by two decades of economic hardship, when very few of the surviving performers could make a living for themselves. Cambodian Living Arts stepped in to support those performers who, despite their deep knowledge and skill, had either retired or reduced their teaching and performing loads. Now, it funds 16 classes throughout Phnom Penh and seven other provinces to promote the tradition. A TEENAGER who has spent three months volunteering in Cambodia is appealing to local people to give young Cambodian women the chance of a university education. Sally Murray, 18, of Wray, near Lancaster, has recently returned from a voluntary placement in the Far East, organised through the Life and Hope Foundation -a Cambodian charity that works to improve the lives and prospects of orphans, vulnerable children and disadvantaged people. The cost of providing a university education is around £600, which can be paid over three years in monthly installments. Anyone who would like to get involved can visit www.watdamnak.org/lha/ or contact Miss Murray on caniseethemenu@yahoo.co.uk. Countries who are unable to produce enough food for themselves are scouring the world for cheap farmland to grow food and export it home, reports Nick Paton Walsh. Never mind the food miles: when prices are soaring around the world some countries have found a way of keeping their own consumers happy - farming out their farms overseas. China, South Korea and many Arab nations can't produce enough food for themselves, but they do have cash and plenty of it. Now they are scouring the world for cheap farmland to grow their own food and export it home. It's a global trend which has already got the United Nations worried. Huge plots of land in Africa have been secured and now many rich nations are looking elsewhere for farmland. One of Asia's poorest countries, Cambodia, is at the top of their wish list. treatment in Rio de Janeiro. Experts worry that a new form of drug-resistant malaria could sweep the globe, as the malaria parasite becomes immune to the best treatment on the market. Several studies suggest that combination treatments using Artimisinin, the newest antimalarial drug, is losing its strength. The New England Journal of Medicine documented in its December issue evidence of artemisinin-resistant forms of the disease in Western Cambodia near the country’s border with Thailand. The drug, which is derived from a Chinese herb, has failed in two known cases so far and is now taking longer to remove the malaria parasite from the bloodstream, reports The New York Times. Experts warn that the situation echoes the decline of the drug chloroquine in the same area decades ago. Previously the best treatment against the deadliest strain of the disease, it became virtually insolvent as the disease’s resistance to the drug spread to all parts of the world. Health authorities told the Times that it is particularly troubling that there are no new drugs to replace artemisinin-based combinations if its resistance spreads. And recent news reports indicate some positive developments in malaria treatment. The medical journal The Lancet says in its February issue that “substantial progress” has been made in malaria research, according to experts, who note that trials of a new malaria vaccine candidate developed by British drugmaker GlaxoSmithKline are ready to go ahead with a third phase. Reuters reported this week that the Swiss drugmaker Novartis is releasing a new antimalaria drug, Coartem, that can be dispersed in water to make it easier to administer to young children. Xinhua reports that malaria cases and deaths declined in Cambodia overall last year, by 8.5 percent and 25 percent, according to the National Malaria Center, which reported that the number of cases fell to 59,840 from 54,784 in 2007, and the number of deaths was 184 from 241. Experts attribute the improvement to early diagnosis and treatment, improved health education in rural areas, and the widespread distribution of mosquito nets treated with insecticide. In a joint communiqué released on Wednesday January 28th, MPs of the Cambodian political opposition, members of the Sam Rainsy Party (SRP) and Human Rights Party (HRP), condemn the attitude of the Phnom Penh municipality authorities and the “grave violences” exerted towards Dey Krohom inhabitants during their eviction and the destruction of their houses on the morning of Saturday January 24th. In the declaration, SRP and HRP elected representatives assert that these violences constitute a grave violation of Human rights and housing rights, and point a finger at the responsibility of the Phnom Penh municipality in the operations conducted by henchmen of the 7NG company, under the approving, not to say encouraging eye of police forces and firemen. “The role of authorities is to make sure that the law is abided by, and to take care of citizens' security and interest. But on the contrary, the authorities in place use their power to order armed forces to destroy dwellings and torture the population in the sole interest of traders, unlawfully”, they write, thus calling the Cambodian government to take urgent measures to put an end to “illegal actions” committed in land conflicts, and to condemn the authorities who give orders for them.. Finally, the elected representatives of the Cambodian opposition ask the municipality of Phnom Penh to distribute foodstuff, provide healthcare, accommodation and compensations to former Dey Krohom dwellers, evicted on Saturday January 24th. Prime Minister Hun Sen speaks Wednesday at a decentralisation conference in Phnom Penh. PRIME Minister Hun Sen has warned that future district, provincial and municipal councillors - to be elected through indirect nationwide elections in May - should not meddle in foreign affairs, despite the impending devolution of political power to the sub-national level. Hun Sen, speaking to more than a hundred high-ranking government officials at Chaktomuk Theatre Wednesday during a decentralisation conference, highlighted the Taiwan-China dispute as one in which council members should hold their tongues. "After the election, if the councils become independent and recognise Taiwanese independence, it will be wrong, as there is no such law," Hun Sen said, referring to Beijing's commitment to a "peaceful reunification" with Taiwan. "Cambodia recognises the one-China policy," he said. Cheam Yeap, spokesman of the ruling Cambodian People's Party , said that the prime minister was merely expressing concerns that the new councils may become confused about central government policy. "The premier's message was to repeat government policy so that the new councils understand our foreign policy," he said. On May 17, Cambodia will hold its first elections for positions on district, provincial and municipal councils as part of the government's drive to transfer more decision-making powers to the local level. Hun Sen said also that the central government does not have sufficient ability to effectively provide public services in the Kingdom's remotest areas, and that it was preparing local administrations by equipping them with staff, finances and other resources. "We hope that the reform will provide better services and bring about a reduction in poverty," he said, adding that after the May elections, councils will be able to remove local officials if their performance falls below a certain level. But Sam Rainsy Party lawmaker Yim Sovann said that since the only eligible voters were sitting members of the country's commune councils, local people would have no hand in electing new officials. "People are not able to express their rights to elect their leaders in their districts and provinces," he said. "The SRP will participate in the election. We will have our representatives, who will act as a watchdog over local developments."